Geez. I must have made this coffee pretty strong, I’m all exclamation points this morning. I’ll try to mellow it out now. But this is exciting! (Whoops….) Since July, I’ve been engaged with my readers in a quest to find a retail source for those classic style rattan carpet beaters. Lots of spankos apparently want to try these out, but they aren’t easy to find. This is not for woodworking, but your grandmother would have been very familiar with it. You simply hang your carpets outside periodically and literally beat the dust out of them. 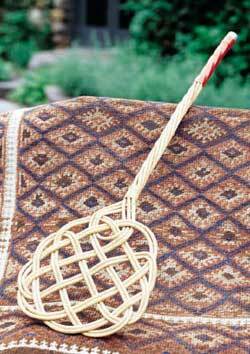 The natural Rattan is flexible, yet packs a real punch. They actually have many home uses that vacuums can’t touch – like beating the sand and grit out of beach towels and picnic blankets (before they clog the washing machine), cleaning the front door mat, not to mention the car mats, getting stuff off of drop-cloths and tarpaulins, and so on and on. This classic household tool has stood the test of time. We like them a lot. They are also great fun. Try and tell me these boys aren’t closet kinksters! “Your grandmother would have been very familiar with it” – I just bet she would have. “Many home uses that vacuums can’t touch” – check. “They are also great fun.” Ayup. Gary says “I ordered one and I can testify it’s great fun indeed.” Thanks very much, Gary. Later Post: Puppy Girl Spanking?